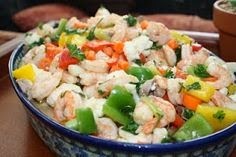 Many would think that this recipe is one that is typically made in the summer when people are craving seafood, fresh produce is abundant and a cool appetizer is a bright addition to any party. Well in our family this appetizer is synonymous with Christmas! Every year my family has gone to East Nashville where my mother's "sibling uncle" and his family live for a gathering of loved ones. Jimmy is called her "sibling uncle" due to the fact that he is only a few years older than my mom's oldest sister. It is always a fun time filled with the children watching A Christmas Story in the den while the adults visit and sing Christmas carols together in the kitchen and living room. When we were younger, my cousins and I would pile into the den, laying one on top of the other, watching for the hundredth time a story of little boy who only wanted a little Red Rider BB gun. As the youngest, I was always sent to get more food, fill up the punch cups and generally run errands for my older cousins and my brother. I didn't much mind this as it meant I got first dibs on what was at the dining room table. I would stuff myself full of sausage pinwheels and pick out all of the shrimp and mushrooms from the Shrimp Medley, leaving for my cousins cauliflower and carrots (of which I had no interest). It is memories such as these that make me eternally grateful for my large, ever-growing, family who may not see each other as much as we would like, but when we get together all one really needs to know is whether you sing with the bass, the sopranos or the altos for there will be harmony once again! shrimp and vegetables, toss to coat well. Cover; refrigerate several hours or overnight, tossing occasionally. To serve, lift shrimp with slotted spoon. This makes me smile! This dish screams Christmas for me too!